On one side of the Plexiglas you’ll find 12 men, on skates, smoothly cruising from one end of ice to the other. The announcers, rambling sweet nothings in the ears of their listeners while their broadcasts give the outside world a glimpse of what is happening. Both teams continue their attempt to knock the small rubber disk into a narrow box of netting and will let nothing get in their way. Thousand of people cheer these men along, and they barely have a care in the world. A small distance off, down the hall, in an secluded corridor, there are 12 women with similar expertise. A smidgen of fans sit in uncomfortable bleachers, but the players expected this. They push with the same objective as the men, determined to give the onlookers a quality show. Despite the extreme differences in scenery, both of these teams are playing at the highest level of their sport: This is professional hockey. In 2008, the United States witnessed the election of its first black president and yet this facade of progress, did not change the deeply embedded racial issues of this nation. Though there has been much improvement since the 1964 Civil Rights Act, there is still a lot of “firsts”to be achieved in American, black history. Furthermore, the Title Nine Act of 1972, is what helped to enforce the amount of opportunity that was given to women especially in the realm of college sports. Historically speaking, being black in America has not been the easiest way of living, but being a woman comes with a completely different load of disadvantages. More specifically, in the world of hockey, both of these characteristics have become a disservice for those who want to play hockey. Now imagine being both black and a woman and still overcoming these barriers: It’s hard isn’t it? Blake. Barons. Boston. Blades. Bolden. Black. The relationship of these words goes further than the aural alliteration, and has become synonymous with the first black woman to be drafted in the Canadian Women’s Hockey League (CWHL). On August 26th, 2013, five teams convened for a conference call and conducted the fourth annual CWHL draft. After entering herself into the draft and paying a registration fee of 150 Canadian dollars ($125), Bolden was chosen, but there was no grandiose announcement made. There was no camera waiting for her cell phone to ring, and there was certainly no telecast to introduce her to the rest of the sports world. This was an historical moment in sports, and yet the most credible documentation of this event is the news release that was posted on the CWHL site the following morning. Bolden was seven years old when her stepfather worked security for Cleveland Lumberjacks, a member of the International Hockey League (IHL). She enjoyed the perks of all- access passes, visits to the locker room and even having the players at her birthday parties. She told her stepfather that she wanted to try hockey and after pushing around a chair on the ice she was formally introduced to the sport. It wasn’t until she was 12 that she started to really get into the sport, joining her city’s junior league, the Cleveland Barons. 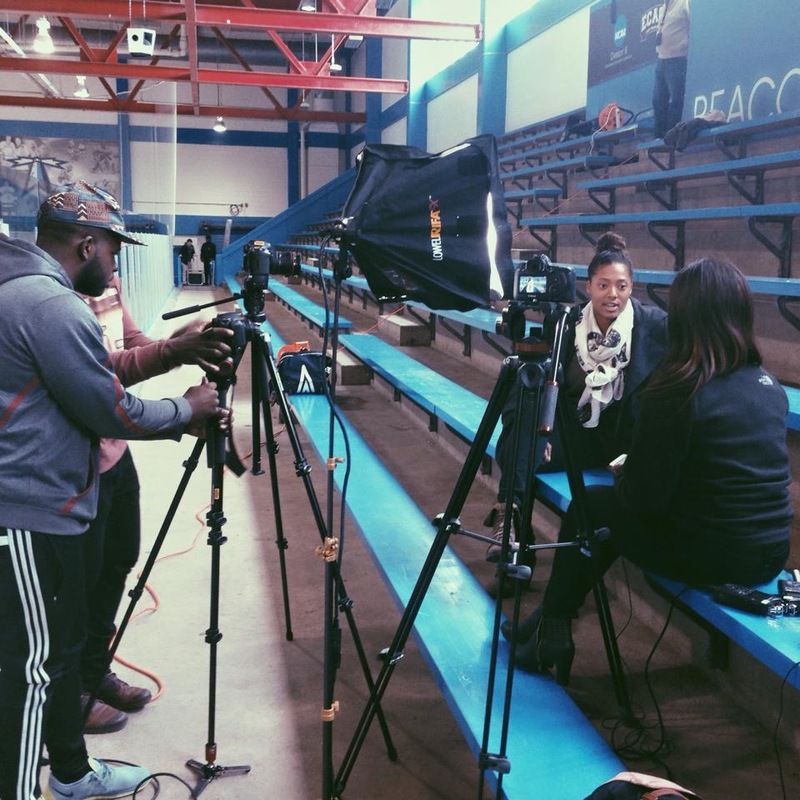 Bolden always realized that she was usually the only female, or black player on her teams, but she never let it deter her and her love of the game. With over 40 years of experience in sports, Digit Murphy, the current head coach of the Boston Blades, understands the stigma that comes with women’s hockey. She suggests that women sports are judged with the standards used for men. Murphy explains that women do not have the same amount of resources and opportunities as men when it comes to sports. Other than the CWHL, Murphy puts in perspective that the only other opportunity women have to play professional hockey are the six spots on the Olympic team. This is the biggest platform the sport has to offer, but the chance only comes around every four years. The former Cornell hockey player praises the “introduction and enforcement” of Title Nine realizing how it has aided the growth of women’s athletics. She concludes that a paradigm shift must be made to redefine professional sports for women. As long as women’s hockey is defined through the lens of men’s hockey, women’s sports will continue to be limited by this dualism. After walking up a narrow flight of stairs of an undisclosed brick building in Dorchester, the visitor approaches a mysterious looking door that can only be unlocked with the ring of a bell. The camera overhead scans their face as the receptionist decides whether or not to grant them access. Inside of the loft is a room filled with an array of workout equipment. This is InnerCity Weightlifting (ICW), a nonprofit organization aimed at empowering urban youth, and keeping them off of the streets and out of the jailhouse. ICW keeps its location a secret in order to keep the members safe since most of their students have criminal backgrounds. Right past the receptionist’s desk, in the back left corner, sits Bolden, the student services manager, tapping away at the keys of her Mac desktop. This small, homey environment, is where Bolden spends her 9-5 hours every weekday. There are many contrasts between the CWHL and the NHL, but there is one factor that stands out among the rest, salary. The 30 team men’s league, and the five team women’s league are both professional hockey teams but the Stow, Ohio native points out the fact that the CWHL players do not get paid. If you walk through Gate D of Boston College’s Alumni stadium, and up another narrow flight of stairs you will find the office of women’s ice hockey head coach, Katie King Crowley. Along the concourse of the stadium’s second level, the offices are hidden in the walls, barely discover-able at first glance. Crowley, the 2015 American Hockey Coaches Association (AHCA) Women’s Division One Coach of the Year, sits comfortably in her neat office as she mulls over the close of her eighth season. She humbly mentions that her team had three losses this season in contrast to a program high of 34 wins. The former Olympian, turned coach led her team to their fourth Frozen Four in the last five years and yet this No. 1 ranked hockey team is still at the bottom of every “BC Superfans” to-do list. Bolden strolls into Clark Athletic Center, on an early Sunday morning. She is sporting a neat bun at the top of her head, accented with an UnderArmour headband to complete her signature look. Her gigantic, black Bauer bag is slung onto her back as she ends her current phone call conversation. She greets her teammates in the lobby, before proceeding to go change in the locker room. She makes no money from this but she loves every moment of it. Race and gender have wrongfully placed a designated bunch in the penalty box, but the only foul committed was by society. Men and women alike have failed to give these women the respect that is due, but these women fearlessly continue to play. Final Note: The previously disbanded National Women’s Hockey League (NWHL) was launched on April 13, 2015 in New York. Bolden signed with the Boston Pride shortly after. There are currently four teams in the league, and the season begins on October 15, 2015. Update (3/21/16): Last night Boston College’s women’s hockey team ended a 40-1-0 season after losing to Minnesota in the National Championship. This season Crowley was named head coach of the year for the second year in a row. Her team set an NCAA record for points (588) and assists (376).